We are sorry, but meat boxes are currently unavailable outside of butchery and smallholding courses. Please check our facebook page for updates. All our meat is extremely free range which leads to an unbelievable flavour. This needs to be tasted to be believed! 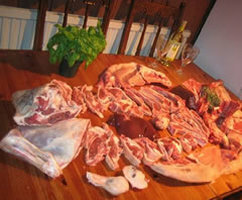 Please have a look at the pages below for more information on the range of meat we have for sale. We hope you will try our meat and taste the difference for yourself.